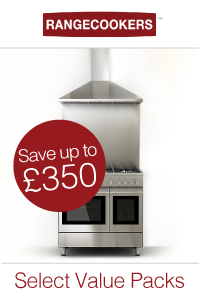 For the UK’s smaller kitchens a 90cm range is the perfect choice. Compact, but packing enough punch for a busy family, it is no wonder 90cm range cookers are hugely popular. Here we take a look at five of our biggest sellers. The hardy perennial of the range cooker world, this enduring model is much loved and as popular as ever with UK consumers, capturing as it does all those deeply embedded notions of cosy country kitchens and days gone by. The Classic 90 comes with either two fanned ovens (a 73 litre main oven and 67 litre tall oven) and electric grill or, on the gas model, a gas main oven and grill with fanned electric tall oven. Gas and dual fuel models have a five burner gas hob, but if you prefer electric there is a choice of ceramic (the less costly option) or induction hobs. Then there is of course the Classic 90 Deluxe, which gives you the benefit of a higher-spec multifunction oven, a more versatile arrangement allowing you to select fanned or non-fanned oven functions as well as fanned grilling. The Deluxe (in dual fuel, ceramic or induction) expands the colour options too - rather than the standard Cream, Black and Cranberry with chrome only, you get an additional five colours, all with the option of brass or chrome trim. All models feature triple-glazed doors with Rangemaster’s removable Handyrack on the main oven door, as well as a glide-out grill tray, plate rack in the tall oven, and self-clean linings in the main oven. Like all Rangemaster models your Classic 90 will be built to order in Leamington Spa, so remember to allow 3-4 weeks for delivery. Something of a wild-card in this category, the quality and value of the DeLonghi Vintage 90DF is self-evident and it is a compelling alternative to the more mainstream brands. Coupled with a highly attractive retro look and the British public’s respect for this familiar Italian brand, the formula seems to be working and we are seeing much interest in this bargain-priced range cooker, and indeed the brand is one of our current favourites. The crisp detailing of its control knobs and the soft tactility of the handles and full width towel rail are complemented by a stainless steel hotplate with its pleasingly rounded front edge and elegant cast iron pan supports, backed by a characterful rear upstand (removable if you prefer). The subtly bevelled recesses on the door facias lend the Vintage 90 some heritage feel, but not too much, and this is a range which will work really well in a traditional or a modern setting, and especially well in a classic or Shaker-style kitchen. The deceptively large (59 litre) main oven is multifunction, giving you plenty of versatility for fanned, conventional and grilling, with a sensibly sized fanned 73 litre oven on the right and a spacious dedicated grill with glide-out tray above. Whether in gloss Cream or Black it all looks and feels great, and really is phenomenal value at this price. DeLonghi are making a great effort to get a hold on the UK market, and this stunning range has been proving a shrewd choice for the discerning buyer. A brand with an enviable global reputation and a very long heritage, Bertazzoni is one of the top Italian appliance manufacturers. The Master Series is their entry-level collection which continues to catch the eye of UK cooks looking for something a little different and a little special. Its immediate appeal is akin to that of a stylish Cappuccino machine with bold, friendly features and tactile soft-touch control knobs. The glorious Bertazzoni roundel on the door is echoed by the temperature dial on the control facia - a nice touch and quite handy too. The triple-glazed drop-down doors feel substantial on their high quality hinges, revealing a sizeable 69 litre multifunction main oven and a small but useful 38 litre non-fanned multifunction oven on the right. Both cavities feature a grill, wipe-clean enamel and a removable inner glass panel for ease of cleaning. Below the ovens is a useful storage area with drop-down flap door. On top, the dual fuel model features a five burner hob including a special central burner with dual control, meaning you can control its small inner ring separately for 0.48kW simmering, or take it right up to the full 5kW for fast boiling or very sizzly wok cooking. There is also a stunning Induction model with a sleek five zone hob. This is a range which looks great in stainless steel, but if you prefer a splash of colour then you have three matt finishes available to you - Black, Cream or a rather lovely Burgundy. Chic and perky, this is a great modern range cooker from a truly authentic brand, and a sound buy. Belling has always been the brand aimed squarely at the family market, and the current range line-up excels at offering a very impressive balance of quality and value. The Farmhouse 90 mixes traditional character with modern lines, with gently bowed, lightly bevelled doors and simple but elegant handles and knobs all adding up to a very palatable look which does not go too far down the country cottage path. A touch-control auto-timer with bold display also brings a contemporary feel. If you think paying less means a flimsier product, then you may be in for a surprise as this Belling feels solid as a rock, with a satisfying clunk to the doors. Belling have spent a lot of time getting this series right, and it shows. There are two fanned ovens (58 litres and 86 litres) with electric grill, or a gas main oven and grill with fanned tall oven on the gas model. On gas and dual fuel models a five burner gas hob features an upgraded 4kW central burner, or there are ceramic and cost-saving four zone induction hobs to choose from, the latter being a fantastic and budget-friendly way to get the benefits of touch-control induction cooking. Three paint finishes are available - Cream, Black or Silver, with chrome trim. All oven interiors feature a special wipe-clean enamel, with standard shelf racks, and a plate rack is available as an optional extra. Yes, it is our own brand but it definitely deserves inclusion in this list as it continues to be a highly popular choice with our customers. Our brief was to develop a superb value, well made and attractive range cooker with broad appeal, and the Select 90 lives up to all of those expectations. Its crisp, straightforward and contemporary design is a great fit with any kitchen whether in stainless steel or the particularly handsome Gloss Black. The main oven is impressively deep, with a 65 litre capacity, and is a multifunction cavity offering fanned, non-fanned and grilling functions with the second, 40 litre conventional oven giving you and additional grill. The storage compartment below has a flap door. The control panel features crisp, metalised control knobs and a digital programmer, as well as laser-etched graphics (on the stainless model). Above there are five gas burners under cast iron pan supports, and a single-piece stainless steel hotplate pressed into three spill-wells. Optional extras include additional shelves, plate rack, oven liners and a plinth kit, as well as cookware like a wok ring, griddle plate and pizza stone. We have worked closely with a renowned Italian factory to get the Select 90 just right, and it continues to be a great platform, especially when paired with our equally good hoods and splashbacks, all covered by a solid 2 year warranty. Just a selection of the many 90cm ranges available at Rangecookers.co.uk, and there are plenty more options at both ends of the pricing scale. If you are finding it all a bit baffling, just call our team on 01244 402975 for a chat about your needs and we will be happy to narrow things down for you. Buying a new range cooker is no small thing, and we are dedicated to helping you make the right choice.